The muscle testing exam performed in this office is called System Strength Analysis. This type of testing provides a great deal of information about the energized status of the body and its various organs, glands and systems without having to penetrate the skin or use invasive techniques. The degree of accuracy is remarkable and best seen in the results achieved, and the speed of that achievement, by experienced practitioners skilled in this approach. 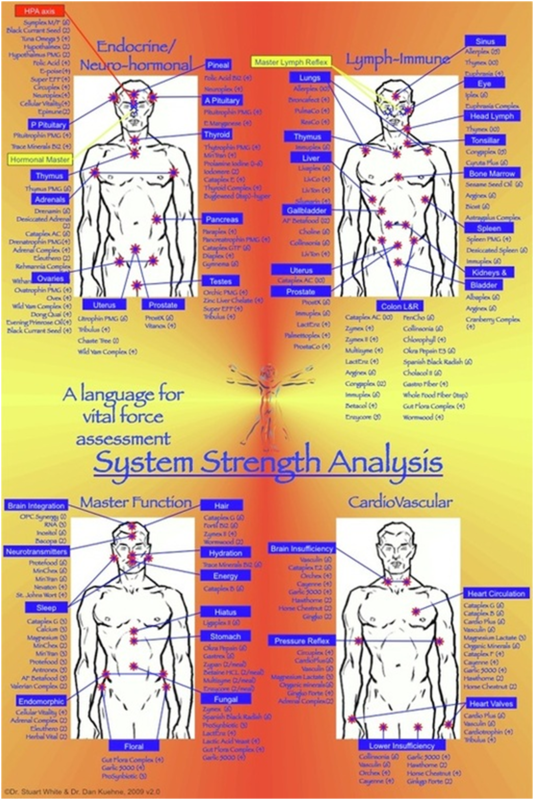 System Strength Analysis is a form of kinesiological testing, of which there are many variations. This technique of analysis is growing daily, and many more practitioners are finding the advantage of quickly surveying the body without unnecessary expense or penetration. The enlivening achieved through this approach is exciting to experience in your own body. It creates an interest in finding weaknesses before they manifest as conditions or diseases, and this is truly a form of prevention.